Prepare Garlic Chipotle Marinade: Purée all ingredients in a blender except TABASCO® Chipotle Sauce, salt and steaks. Transfer purée to a large mixing bowl; add TABASCO® Chipotle Sauce and salt as desired. Place steak in a sealable container and pour in marinade; cover and marinate in refrigerator for a minimum of 6 hours. Prepare Sweet Chipotle Marinade: Purée all ingredients in a blender except shrimp and chicken. Place chicken in a sealable container and shrimp in separate sealable container; divide and pour marinade into each. Cover and marinate shrimp in refrigerator for 8 hours and chicken in refrigerator for 24 hours. To prepare, remove steak, shrimp and chicken from marinades and set aside. Heat grill to medium-high heat. Place meats and shrimp on grill in order of required cooking time – first, the chicken, then the steak and shrimp – and grill to desired doneness. Slice steak and chicken into strips. 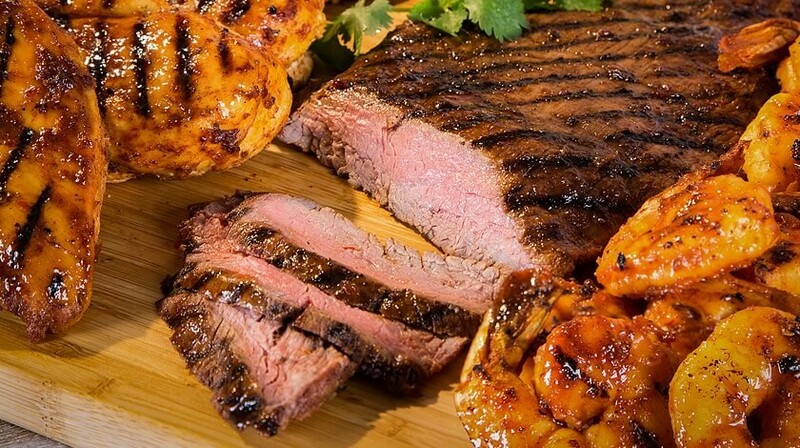 To serve, place steak, shrimp and chicken on large platter, accompanied by traditional side items such as fresh guacamole, pico de gallo, grilled onions, fresh limes and fresh corn tortillas.